Today is Lilly’s 10-month birthday and time has, as my friend Allidah says, just evaporated. 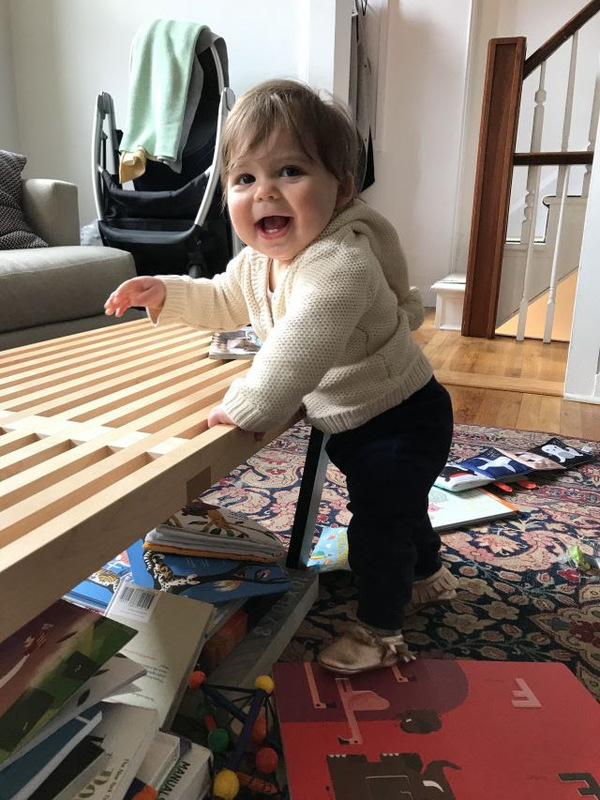 She’s just learned how to pull herself up to standing, which makes me both proud and terrified. Have to install that baby gate, stat! In other news, today is Equal Pay Day, which was created to raise awareness around the persistent pay gap between men and women. Fortune’s Broadsheet has a great overview of the issue and useful further reading. Relatedly, I loved this First Round Review piece about how women and startups should approach compensation discussions in order to get closer to pay equity. Both are great newsletters, especially for anyone in the tech space. Healthyish baking: Rob is usually extremely skeptical when I make desserts with non-traditional ingredients but even he approves (heartily) of this chocolate-cinnamon cake made with almond flour and coconut sugar. Julia Turshen created it for her wife, Grace, who is diabetic, and it’s perfect for gluten-free or sugar-sensitive friends but delicious for all us regular people, too. Nondairy discovery 1: While I’m not lactose-intolerant, I definitely can’t down a glass of milk (though right after I had Lilly I went through a brief, glorious time where I could eat anything without tummy troubles). I used to make my own nut milk and it was easy but messy, and I kind of gave up. Now I just buy it (look for carrageenan-free brands) and recently hopped on the oat milk bandwagon when I spied Oatly in my local market. Yes, it’s buzzy but it’s also very, very good and the only non-dairy milk I’ve found that doesn’t separate in coffee. I’ve been using it for smoothies and very meta overnight oats. Nondairy discovery 2: As I’ve mentioned, I love exploring the yogurt aisle of any grocery store (what do you do for fun?) and always want to try new ones. I found out about Lavvavia Of a Kind’s 10 Things newsletter, and just got my hands on some today. It’s completely plant-based, made from pili nuts, plantains, coconut, and cassava, with no added sugar. I wasn’t sure what it was going to taste like but the answer is: extremely tasty. It’s light and tangy, with a really nice texture. Buying for everyone I know: Whether she’s addressing grief, air travel, or mid-life crises, illustrator Mari Andrew manages to capture all the feels in a witty, genuine, and insightful way. Her new book, Am I There Yet: The Loop-de-loop Zigzagging Journey to Adulthood, is the perfect gift for yourself, your sister, your best friend—basically anyone. Practicing for the Disney years: We don’t watch much TV with Lilly but a couple weeks ago we were in need of some couch time so we cued up Coco, Pixar’s hyper-saturated celebration of Mexican culture. The seamless switching between English and Spanish reminded me of my Miami childhood, and the songs were infectious in the best way. Oh yeah, and Lilly enjoyed it too. Making even better coffee: Former Birchbox-er Kirby is running social at Trade, a just-launched coffee ecommerce site. You can buy beans (guaranteed to be freshly roasted) from dozens of top roasters across the country, as well as every manner of coffee gear. While I like buying beans in real life, I love the idea of learning about and trying small-batch roasters I might not be able to find in my neighborhood. I took the coffee recommender quiz, which suggested beans according to my brewing style (Chemex), drinking style (black), and flavor profile (medium, not too weird). And that’s how I met Madcap, a Grand Rapids, MI-based roastery that might edge out Tandem as my new favorite. ​Renting my wardrobe: After years of hearing Rachel, Juliette, and countless others rave about Rent the Runway’s Unlimited service, I finally decided to try it for myself. I got my first shipment today (silk tops and dresses, obvi) and am excited to jazz up my wardrobe without having to actually shop for anything. Happy listening: My friend and blogger extraordinaire Grace Atwood just launched a new podcast called “Young Adulting” where she and her best friend Becca dissect the latest and greatest in young adult fiction. It’s exactly the escape we all need from the thrice-daily New York Times alerts. Julia is after the best high-waisted workout pants. I know I’m a broken record but Outdoor Voices are the most stylish and flattering options out there. I love the 7/8 Springs Legging, which are full-length on my 5’3 frame. They’re not the best for high-intensity; for that, I’d go with Lululemon’s performance tights—they are great quality and stay put. Hayley requested healthy snack ideas, which is great timing since Rob and I are both trying to break ourselves of our mid-afternoon sweet habits. Here are some go-to’s, and I’d love to hear yours! Lunch or dinner leftovers—grain salads or veggie sides!